From the 2000 SPx "Powerhouse" Football Collection. a 26-card insert Football Lot. The lot includes #'s PH 1(4)-2(5)-3-4-5(5)-7(4)-8(2)-10(4). The cards are mint. Pittsburgh Steelers Wide Receiver. 1999 Collector's Edge Odyssey # 116. ALL OF MY PRICES ARE FIRM. Select quantity. Price is for 1 card. For condition please see photo(s). The card pictured is what you will receive. The item may or may not be shipped as pictured. $.55 flat standard USPS shipping for the first card. Please request an invoice before payment if combined shipping desired on multiple items. Multiple items will ship at the lowest possible rate, unless otherwise specified. Check out my other items listed! TROY EDWARDS #169. 1999 Bowman Interstate. 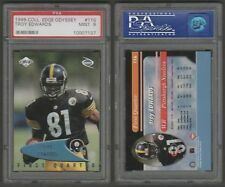 2000 Upper Deck UD #45 Troy Edwards RC Pittsburgh Steelers Rookie Card! This is a great buy on this TOUGH to find TROY EDWARDS 2001 Quantum Leaf INFINITY GREEN Card #152 Serial #d /25 Made! You will receive the item(s) pictured. 2000 Quantum Leaf Troy Edwards infinity football parallel card. This great card features the Steelers receiver, and is card 228. The card is in ex/mt condition (colorful, crease free surface-very light border wear). 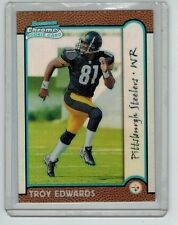 1999 Prism #113 Troy Edwards RC Pittsburgh Steelers Rookie Card! 1999 Playoff Contenders Troy Edwards rookie of the year contenders AUTOGRAPHED football card. The card features the Steelers rookie, and is card number royc-11. The card HAS A SMALL FLICK ON UPPER RIGHT CORNER-not in mint condition. 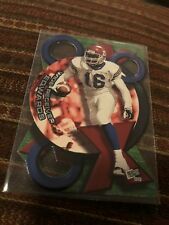 1999 Revolution Troy Edwards shadow series rookie card. This great card features the Steelers rookie, and is card number 134. The card is in nm condition (colorful, crease free surface), and is serial numbered 41 of 99.